Clark was born in Washington, D.C. and raised in Northern Virginia. He worked several jobs throughout his life, the longest and most recent being for a tow truck company. In 2004, he had a work-related accident that left him badly injured and took several years and five back surgeries to heal. The strain of being injured and out of work led to the demise of his marriage and in 2012, it came to an end. With limited options for housing, his brother convinced him to move to Atlanta to live with him. Being unable to work and dependent upon his brother financially sent Clark into a deep bought of depression. He reached out for help and contacted Grady Memorial where he was admitted to the mental health area to receive inpatient treatment. While he was at Grady, he and his brother’s relationship became strained and his possessions were removed from the home. After he was discharged from the hospital, he began staying in various shelters throughout the city, and soon found himself sleeping on the street. Exposure to the hot Atlanta sun sent Clark to the E.R. at Grady several times during the summer months. During these trying times, he made friends with an Atlanta Police officer that was helping him as much as she could by bringing him water and food but recognized that action needed to be taken. He took one final trip to the E.R. and while he was being treated, the officer made sure that his situation was brought to the attention of the staff and was able to get him in contact with a social worker. The social worker felt that Homes of Light was the best organization for his needs. His visits to the E.R. over the past few months made him a perfect candidate and we were happy to help. He came into transitional housing where he remained for seven months until he was able to find a permanent residence. 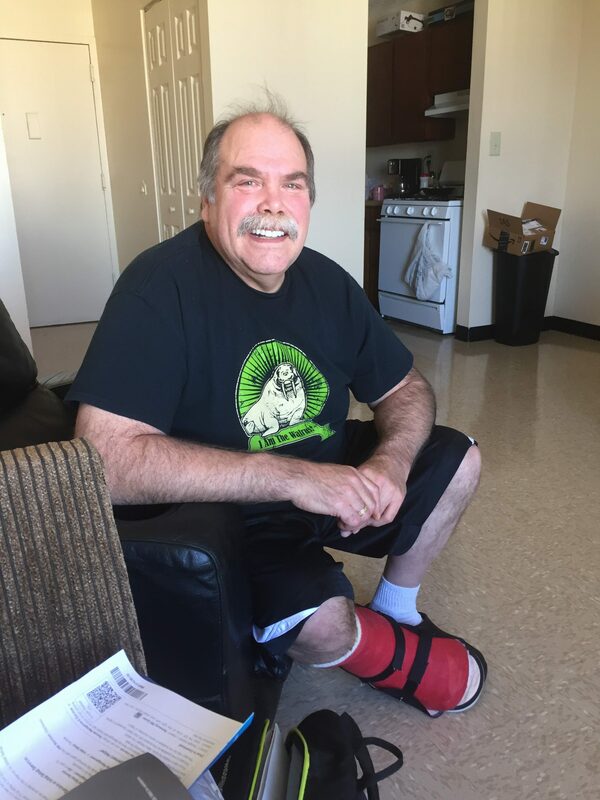 His case worker, Jack, was able to help him get a half-fare MARTA card and schedule him to meet with an attorney at the office to begin his disability claim. He has been in his new apartment for a few weeks and already feels at home. He is looking forward to continuing his recovery and is looking forward to what life in Atlanta has to offer.